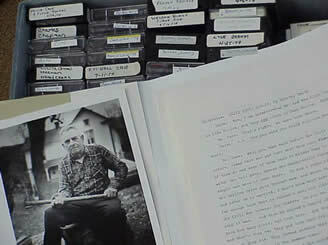 Records the reminiscences of Walter Carter, whose family owned apple orchards on Dickey Ridge, just south of Front Royal, Virginia, in the decades preceding the establishment of Shenandoah National Park. Describes the physical layout of the the orchards and surrounding towns. Discusses the demise of the apple industry in that part of the Shenandoah Valley due to a shrinking work force, as local families were evicted by the state to make room for the park. In the years prior to the Second World War, the primary customer for the Carter's apples, the United Kingdom, placed restrictive tariffs on U.S. grown apples which made it impossible to compete with fruit from Canada and New Zealand. The second part of the interview consists of a driving tour of the orchard area, with Mr. Carter describing the former locations of buildings, roads, home sites and cemeteries. The group is joined by Mr. Carter's wife, Caroline Carter, whose own recollections and comments are included in the discussion. The Carters make numerous references to local families and landowners. Includes comments on the construction of Skyline Drive, which, while providing north-south access along the crests of the Blue Ridge Mountains, resulted in the closing of numerous east-west routes across the mountains. Skyland Orchards (Va.); Apples – Virginia; Orchards – Virginia; Apple industry -- Shenandoah River Valley (Va. and W. Va.) – History; Apple industry -- Virginia – History; Tariff -- England – History; Agriculture -- Appalachian Region, Southern; Agriculture -- Shenandoah River Valley (Va. and W. Va.) – History; Land use -- Government policy -- United States. Dickey Ridge (Va.) – History; Browntown (Va.) – History; Albemarle County (Va.) – History; Warren County (Va.) – History; Shenandoah National Park (Va.) -- History, Local; Skyline Drive (Va.) – History. Steeber, Ken; Smith, Walter; Struthers, Howard; Updike, Gloria.